Enterprise Inns is set to become the UK's largest pub group having announced plans to take full control of rival the Unique Pub Company. Enterprise will pay £609m ($1,092m) to exercise its option to buy the 83.2% of Unique it does not already own. The move will give Enterprise control of more than 9,000 pubs, moving it ahead of rival Punch Taverns. Chief executive Ted Tuppen said the deal was unlikely to run into trouble with competition authorities. 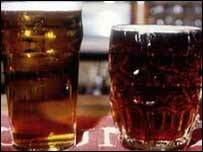 However, he said Enterprise may have to sell about 250 pubs in certain areas to reassure regulators. At 0945 GMT shares in Enterprise were down 2 pence, or 0.31%, to 633p. Solihull-based Enterprise took out the option to buy up the shares when it bought 16.8% of Unique, based in Thame, Oxfordshire, in March 2002 for just over £2bn including debt. "We are creating the largest pub company in the UK and further enhancing the quality of our estate," Mr Tuppen said. "Looking forward our aim is to continue to improve the quality of the estate through working closely with our licensees, investing to improve the joint estates and disposing of poorer performing pubs." Enterprise said current trading is strong and it expects first-half operating and pre-tax profits to be in line with management expectations. The group, which reported a 51% jump in annual earnings last November, said the Unique transaction would be funded mainly with new borrowing. This week, Enterprise Inns was promoted to the FTSE 100 index of leading UK shares, replacing Foreign & Colonial Investment Trust. The change was the only one in quarterly shake-up of the benchmark index.